In birds, males tend to be more glamorous with respect to feather shape and colors. Female birds choose their mate based on the attractiveness of the male! Among all living species, it is birds that have left one and all mesmerized. Be it their flying skills, accurate navigation strategies, or the beauty of their light bodies painted in spectacular colors, birds simply keep the curiosity and research alive for many bird lovers and researchers. Some birds are not so colorful, but some definitely look like an artist's creation with beautiful combinations and contrasts. What gives different birds their distinctive color? Curious as we all are, science and nature together can help us know the secret of their color generation. 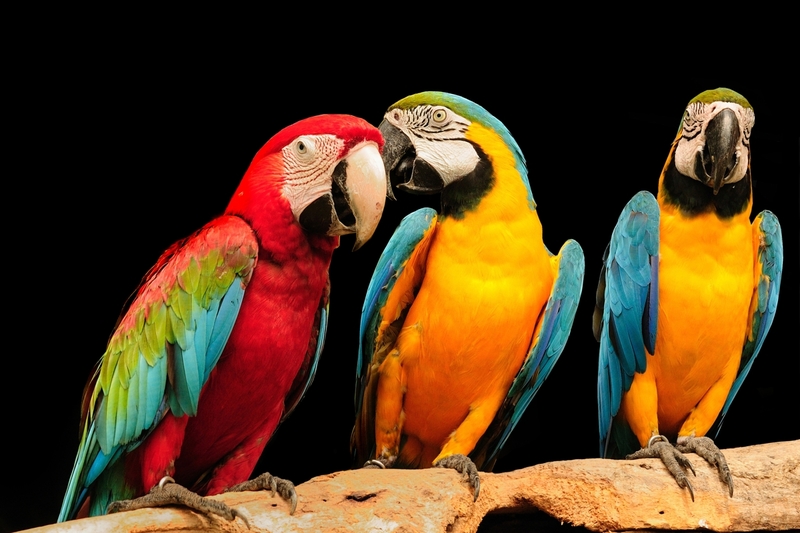 The following piece of article is an interesting compilation of facts about how birds got their color. Let us take a look. It can be said that the concept of colors in different birds is a relatively complex calculation. There are two important factors that are responsible for giving birds their distinctive shades. They are keratin and pigments. These two factors are processed in multiple ways in different birds, which give them the final coat of color. Pigments can be termed as color makers, found in both plants and animals. They absorb certain shades of colors and reflect the others. It is the reflected colors that the human eye captures. Melanin is formed as tiny granules in a bird's feather or the skin. It produces colors, like dark brown, reddish brown, rust, pale yellow, or black. The shade of color depends on the location and concentration of melanin in a bird. Not only does melanin color the bird, but it also serves the bird with strength in the feathers. Most feathers in white color are weak. Black color on the feather or at its tip protects the feather from general wear and tear and strengthens it. Carotenoids are present in plants. Researchers have observed that birds which eat plants and fruits that contain carotenoids have red, orange, or yellow shades. Birds with a combination of melanin and carotenoids are more likely to produce shades of green, like olive green. So, a diet of the bird which includes carotenoids, plays an important part in deciding the color. 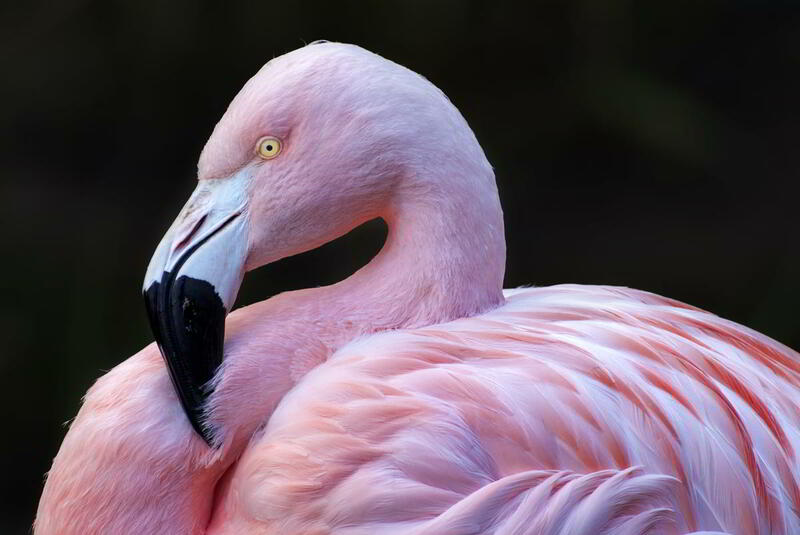 Flamingos, which are pink in color, get the pink shade from their diet which includes shrimp and blue-green algae. 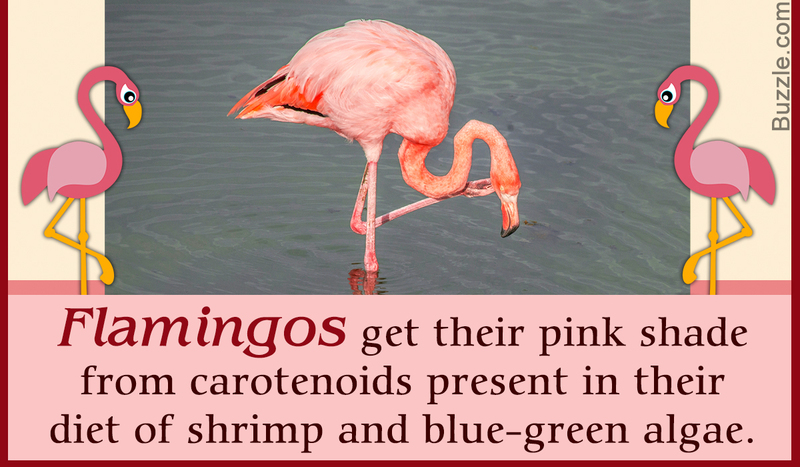 Carotenoids are broken down in the liver, after which the molecular form of these is sent to the skin, legs, beaks, and feathers of flamingos, which gives them a beautiful pink shade. Porphyrins can be termed as essentially modified amino acids. They are very rare and found in a few species of birds. They produce shades of red, green, pink, and brown. 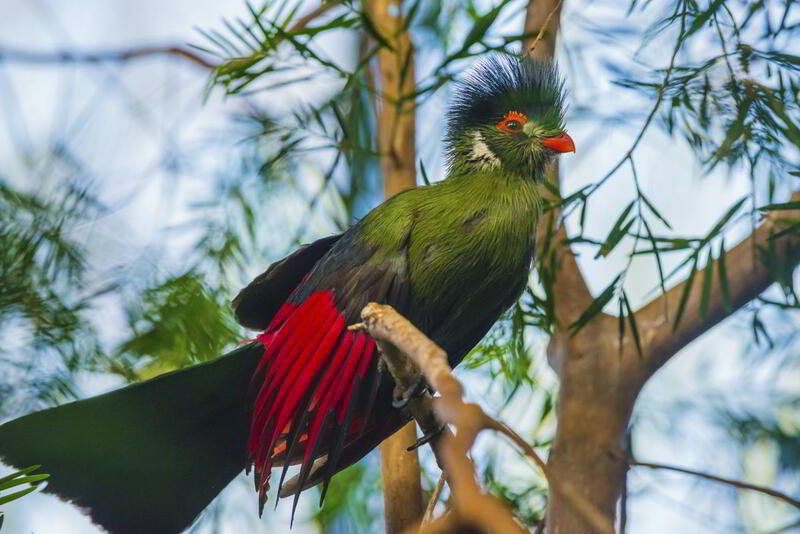 These compounds give African turacos their green and red shades. 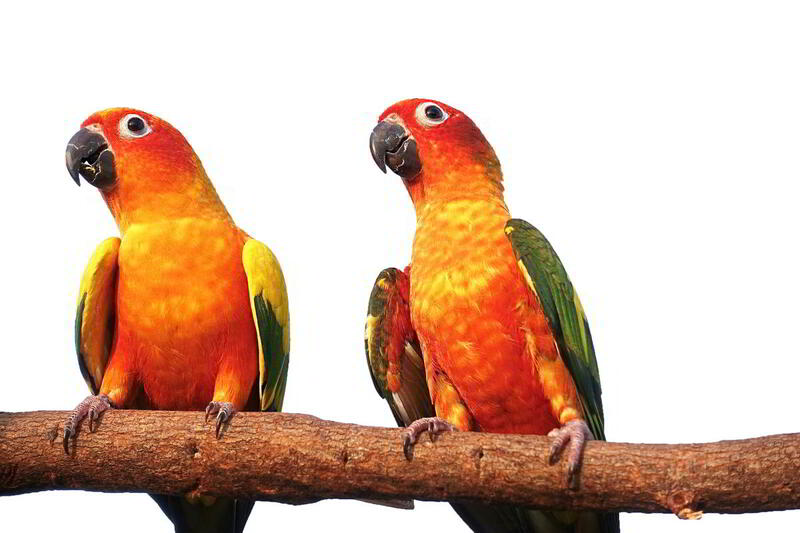 These are found only in birds, like parrots which give them the orange, yellow, and red colors. Many shades of colors in birds are a result of mixtures of pigments. So, the unusual colors in many bird species is a work of two or more pigments. Keratin is also another important factor contributing to the beautiful shades of colors in birds. It is a kind of protein, which is tough and strengthens the feathers of birds. This protein also covers the birds' bills, legs, and feet. A complex procedure takes place when producing colors with keratin in birds. This protein is what makes possible the changing of colors on a bird's body, with the change in angle. Keratin works in two ways to give birds their color. They are called layering and scattering. In the first process which is of layering, short wavelengths of colors, like purple, green, and blue are reflected by a translucent layer of keratin. Other colors are absorbed by an underlying layer of melanin, which is black. So, the way a bird's feathers are layered, determines the shades of colors on the bird. The second process in which keratin produces color is called scattering. The specified nanostructure of a bird's feather gives it a color. 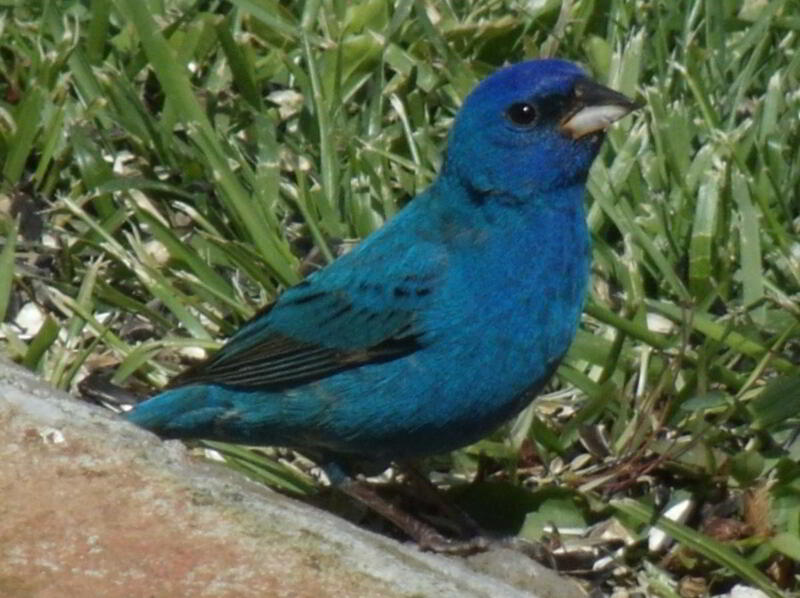 For example, there is no pigment for blue color in birds. Yet, some birds, like Indigo buntings and Eastern bluebirds have spectacular shades of blue. This is made possible by the submicroscopic structure of the feathers of a bird. A central layer of cells in the feathers is surrounded by a 'cloudy' layer. This leads to light waves getting scattered in a way. The light waves, upon scattering, interact in a way which can be termed as 'constructive interference.' So, when this light reaches the eyes, we can see a shade of blue color. 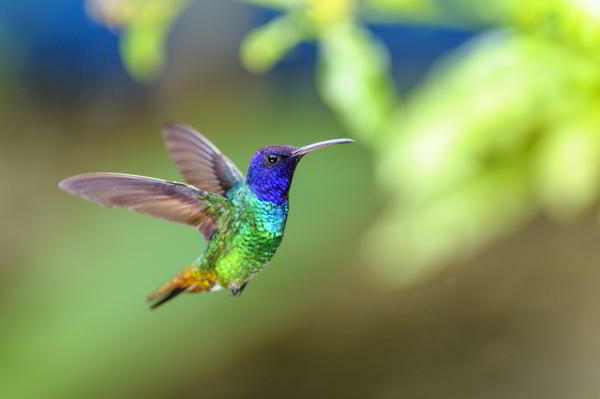 Another example of scattering is of the hummingbird, which has a changing throat patch. The nanostructure of the feathers refracts light. The barbs of these birds are not woven in a tight manner. Hence, they split light, which gives us the different shades of color. It is evident that the colors that different birds have are, in reality, a complex calculation of nature, not only to beautify them, but to give them strength, protect them from light, and in some cases, also choose their mates! This is evident from a research which found that North Cardinals choose their mates based on the darkness of color. Females usually choose males with darker shades, as these shades are produced by carotenoids. So, the better the color, the better is the male at finding food sources rich in carotenoid. This also means that the male has the best of genes and skills. So, this was yet another revelation of the mystery of birds. The next time you see a bird with color, you know what lies beneath the beautiful shades of feather!